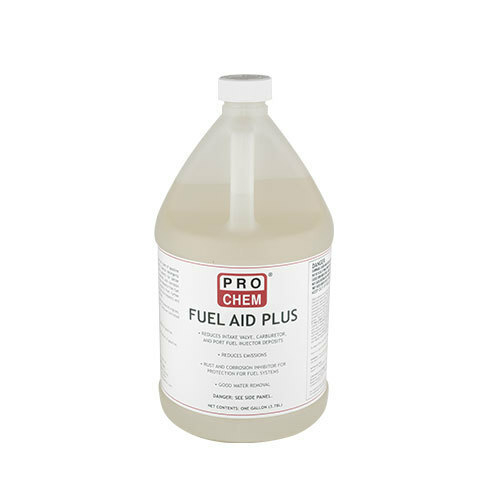 FUEL AID PLUS | Pro Chem, Inc.
FUEL AID PLUS is a premium additive that helps all types of gasoline-powered engines run cleaner and more efficiently. This formula improves the performance of all gasoline-powered engines, including those with catalytic converters and computer-controlled engines. The special detergents in this additive remove deposits and clogs from fuel injection systems for better acceleration. Dispersant and corrosion inhibitor additives clean gums, varnish, and corrosion deposits from the fuel tank, delivery system and carburetors. This additive also protects engines from further corrosion. It extends engine life by eliminating intake valve deposits and lubricating upper cylinders under cold start conditions. It also lubricates cylinder walls and eliminates severe wear of fuel-delivery systems. Add 12 ounces for every 20 gallons of gasoline. In bulk storage tanks, use 2-3 gallons per 1,000 gallons of gasoline fuel. Note: Not for use with diesel fuel.